Vote for this week's JSZ Shore Game Balls! Saint Rose's Riley Maypother is one of 20 nominees from the Shore for this week's Monmouth Building Center Game Balls. Cast your vote now through Tuesday at 3:00 pm! 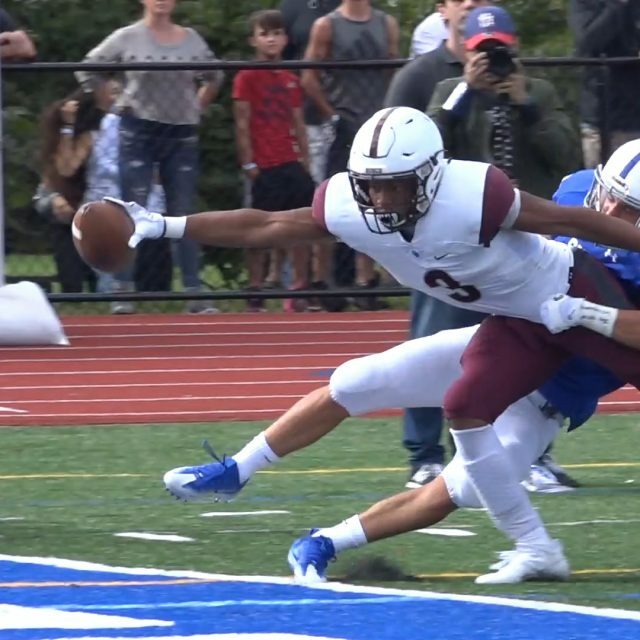 New Jersey high school football action from Week Three is highlighted by one of the best rivalries in America and a South Jersey quarterback who broke the state passing record. 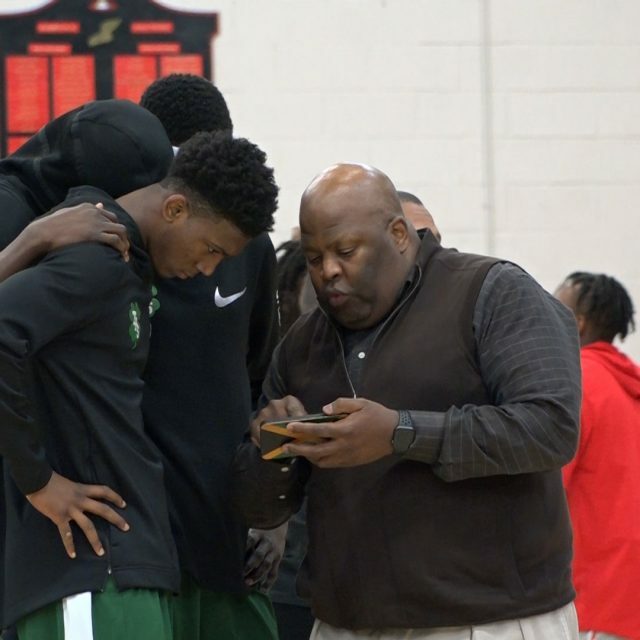 Make sure to scroll down and watch highlights from every game Jersey Sports Zone was at around the state this weekend. Be sure to check in Sunday for the Week Three Top Plays! 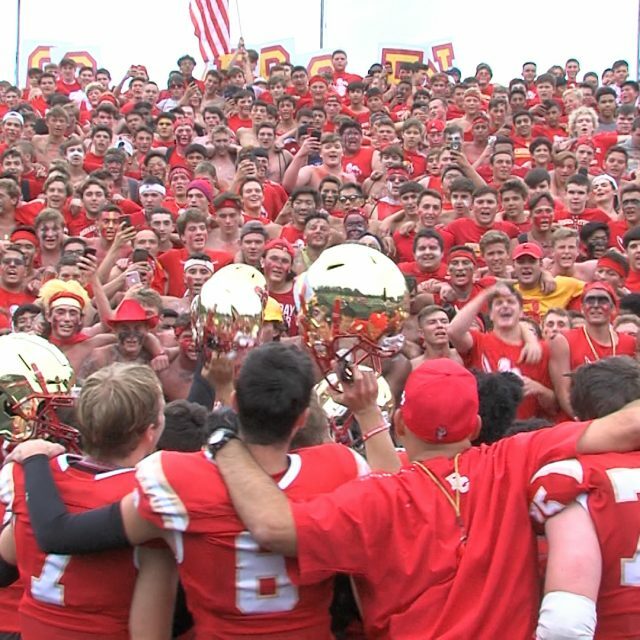 Bergen Catholic 14 Don Bosco Prep 13 Saturday’s game marked the 70th all-time meeting between these two Bergen County foes and one of America’s best high school rivalries surely lived up to the hype. Bergen Catholic stymied a Don Bosco Prep drive late in the fourth quarter thanks to a game-clinching, one-handed interception by Pierson Tobia. Tight end Tyler Devera also caught a trick play touchdown before the half to give the Crusaders a lead that would never be caught. JSZ’s Jay Cook was in Oradell for this exciting chapter of the top New Jersey rivalry: Sponsor Shoutout! 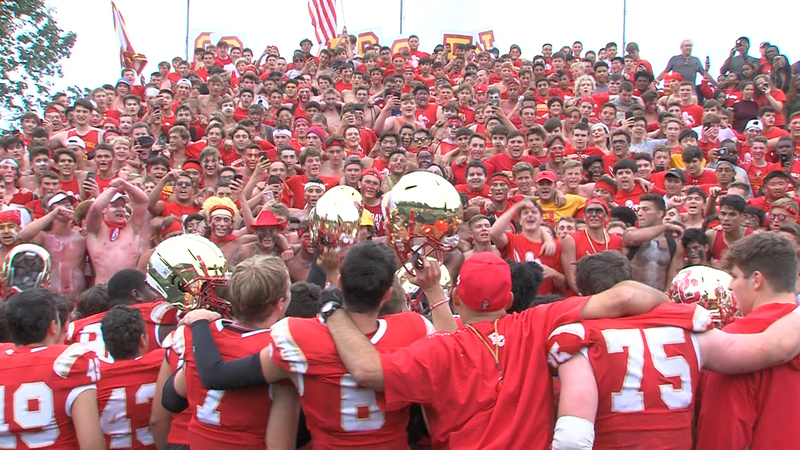 Thanks to Equinox Fitness’ sponsorship of Bergen Catholic, Jersey Sports Zone was able to be at this nail-biting game. JSZ will be on hand at many more Crusaders games throughout the 2018-2019 season because of Equinox Fitness. Woodrow Wilson 59 Cedar Creek 37 Woodrow Wilson quarterback Nick Kargman passed for a state-record 539 passing yards in a shootout win against Cedar Creek. The two teams combined for 96 points in one of the highest scoring games so far this season. 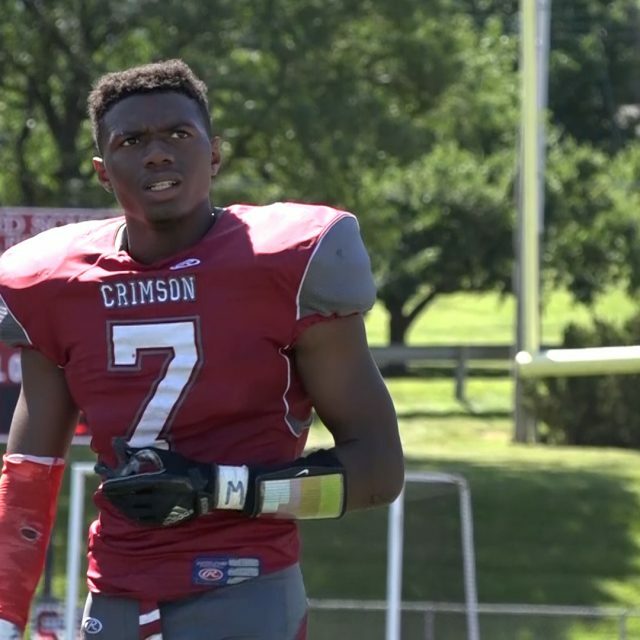 Believe it or not, but Kargman has only one college football offer — Rutgers. JSZ’s Mike Frankel has highlights from the record-breaking day: Westfield 33 Old Bridge 17 Hank Shapiro was a perfect 14 of 14 for 200 yards and 2 TD’s as Westfield rallied from a 17-14 halftime deficit to beat Old Bridge in its home opener. Tim Alliegro ran for 181 yards and two scores and Jacob Saltzer had back to back TD catches in the third quarter to give Westfield the lead for good. JSZ has the highlights and post-game reaction from Madison Bess: Thanks to Assemblyman Jon Bramnick for sponsoring JSZ’s coverage of Westfield High all year long Summit 22 North Hunterdon 9 Summit remains undefeated after a 22-9 victory over the defending Group 4 Sectional Champions. The Hilltoppers defense played a key roll on the victory. Check out full highlights now: Sponsor Alert!! Coverage of Summit is brought to you by Equinox Fitness Clubs. Thank you Equinox! Trenton 30 Nottingham 0 Fans in Mercer County had Nottingham vs. Trenton circled on the schedule. However, no one expected to see a lopsided victory. The Trenton offense in a complete team effort was able to move the ball early to take a commanding lead at half time thanks to quarterback Mahsiah McRae. Then it was the Tornado Defense’s turn to take over in the second half to make sure they secured the victory. JSZ’s Nery Rodriguez has the call: Thank you to Princeton Orthopaedic Associates for sponsoring both our Nottingham and Trenton coverage on JSZ. We look forward to bringing you more North Star and Tornado athletics all year long! Holmdel 35 Keansburg 0 Jeff DeCicco threw two touchdown passes and Dan Tempone delivered a memorable 43 yard punt block and return for a score as the Hornets improve to 2-1 on the season. 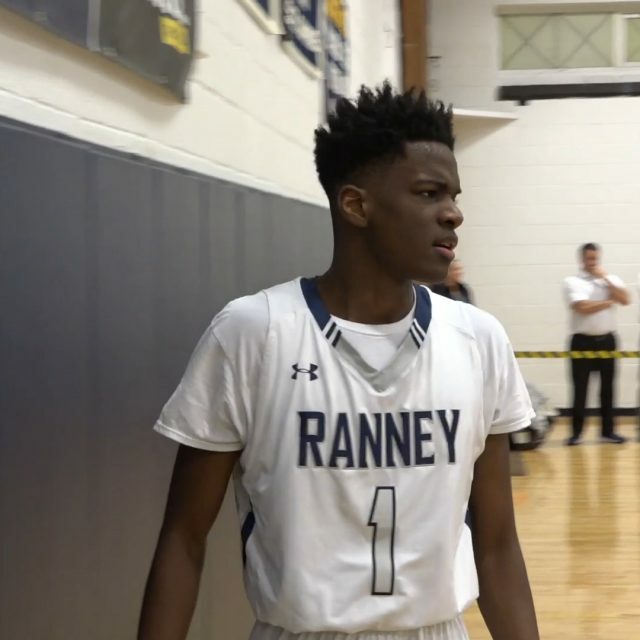 JSZ has some great highlights of the Hornets Saturday afternoon win: Thanks to BCB Bayshore-Your Community Bank for giving us the ability to showcase Holmdel athletics all year long! Toms River North 42 Central Regional 6 The Mariners erupted with 35 second quarter points as Jake Kazanowsky threw four of his five TD passes in the second. Watch highlights of the Mariners reaching the 3-0 mark on Saturday afternoon in Ocean County: Thanks to CJA Construction for sponsoring JSZ’s coverage of the Toms River North Mariners Manasquan 34 Raritan 13 Canyon Birch is one of the nation’s top high school lacrosse players and he’s got skills on the gridiron as well. Birch ran for 112 yards and two TD’s on the ground to go along with a kickoff return for a score as Manasquan reaches the 3-0 mark. JSZ has the highlights of Saturday afternoon Shore Conference action: Jersey Sports Zone’s coverage of Raritan is possible thanks to the support of BCB Bayshore-Your Community Bank Paulsboro 49 Lindenwold 9 Red Raiders quarterback Nick Pellegrini threw three touchdown passes in a West Jersey Football League rout over Lindenwold. 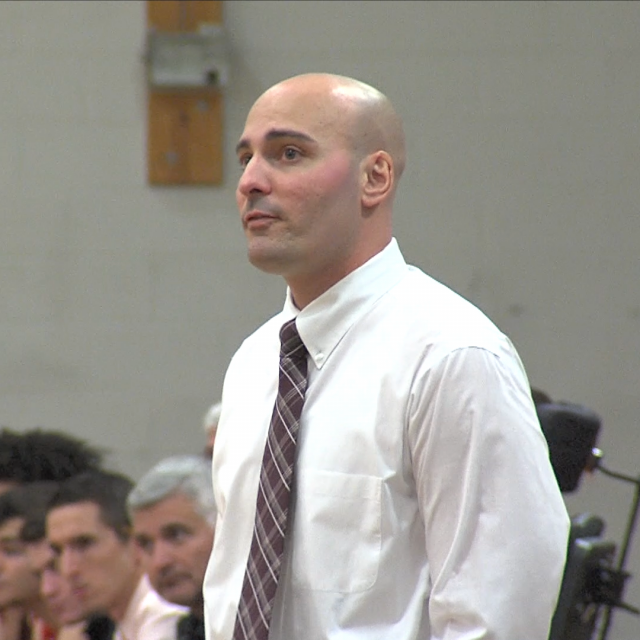 JSZ’s Mike Frankel has the highlights from a blowout win for Paulsboro: Missed our Friday Highlights? 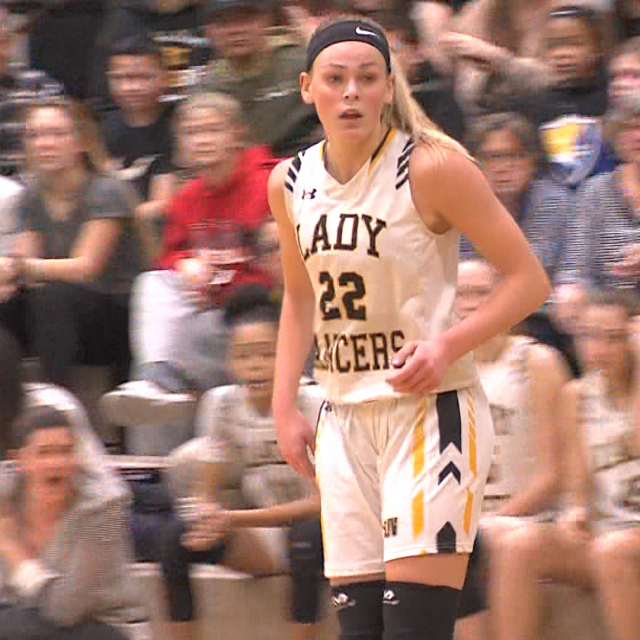 Watch 11 games of action from around the state – CLICK HERE! 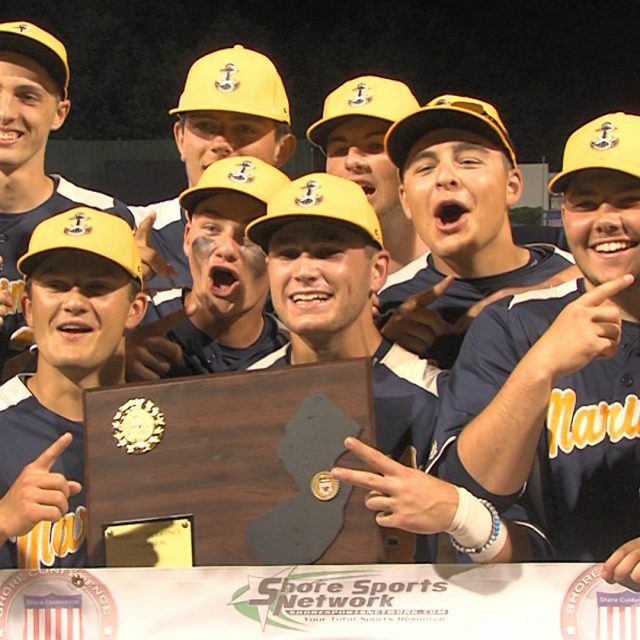 Toms River North 4 Central Regional 0 – Shore Conference Tournament Championship Jared Bellissimo threw a 4-hit shutout with 11 strikeouts and blasted a two-run RBI double to centerfield to lead the Mariners to a second straight Shore Conference title. TRN jumped out to a 2-0 lead thanks to RBI singles by Justin Schaff and Bobby Jeans in the first and second inning. Central loaded the bases in the 6th inning with one out, but Bellissimo struck out two straight to get out of the jam. 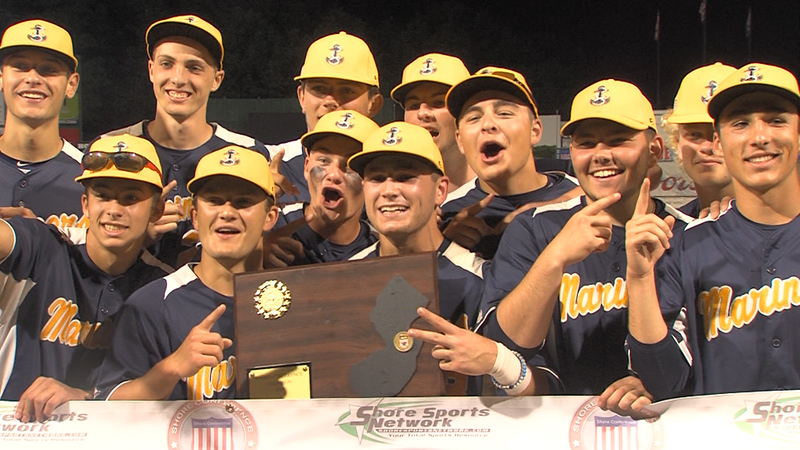 JSZ has the highlights of Toms River North’s second straight SCT title from the home of the Lakewood BlueClaws: Jersey Sports Zone is able to capture great moments from Toms River North thanks to Peak Coaching for Success. Visit peakcoachingforsuccess.com to learn more about their Athlete Development Camp this summer! It’s time to honor outstanding performances from the Diamond. Thanks to our friends at Monmouth Building Center, we’ll have 10 top nominees every week from Shore Conference baseball and softball. Cast your votes NOW through Tuesday at 3:00 pm. We’ll pay a visit to a mid-week game or practice and make a Monmouth Building Center Game Ball presentation. 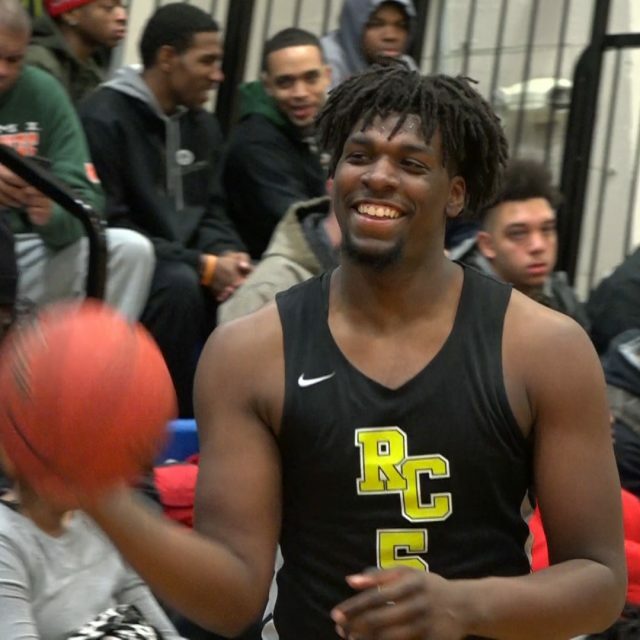 Coaches can always nominate a player – just email rich@jerseysportszone before Saturday night Take Our Poll Take Our Poll Monmouth Building Center in Shrewsbury has been honoring Shore Conference athletes for the past four years. Thanks to the team at Monmouth Building Center for giving us the chance to honor great Shore kids in football, basketball, baseball and softball. 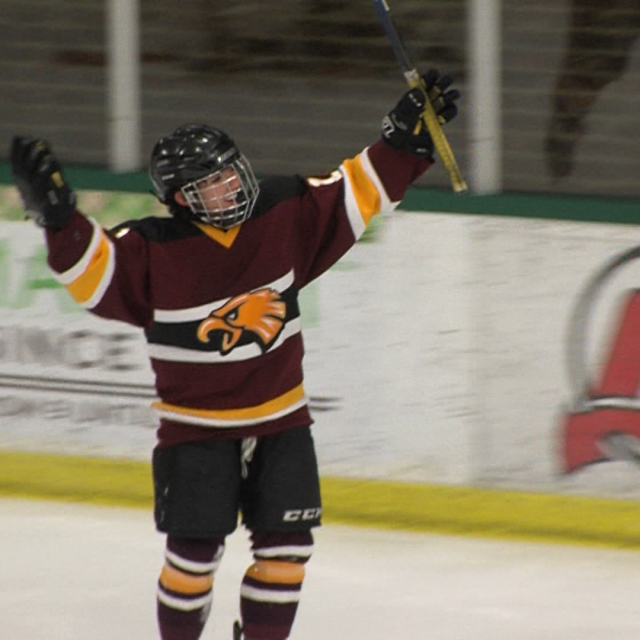 With the high school hockey season wrapping up on Monday with the state championships, it’s time for you to vote for the top goal captured by Jersey Sports Zone cameras and the top save of the year. The winners of each poll will be featured during the Devils March 24th game against the Tampa Bay Lightning. We will keep the polls open until 8:00 pm on Friday. Thank you to the players for all the great highlights during the season and thanks to everyone who watched our videos and voted all season long! 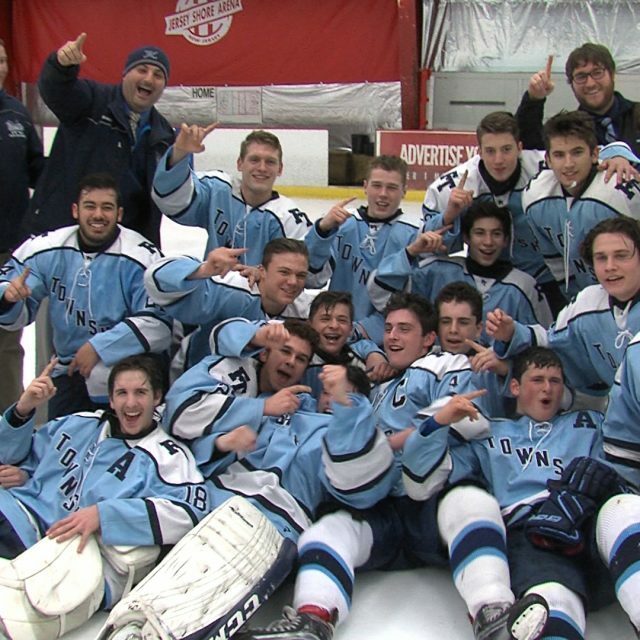 Take Our Poll Take Our Poll We’re excited to honor the top players in New Jersey at our All-State Hockey Banquet during the Devils/Lightning game on March 24th. We’ll show highlight videos from the top players in the state as well as honor the Top 5 goals from February and the save of the year. 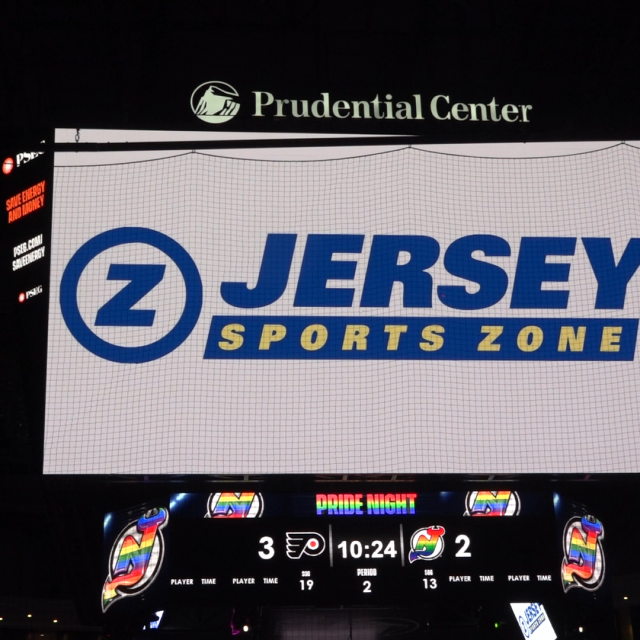 A special thanks to the New Jersey Devils for partnering with Jersey Sports Zone to provide special memories for NJ high school hockey players. 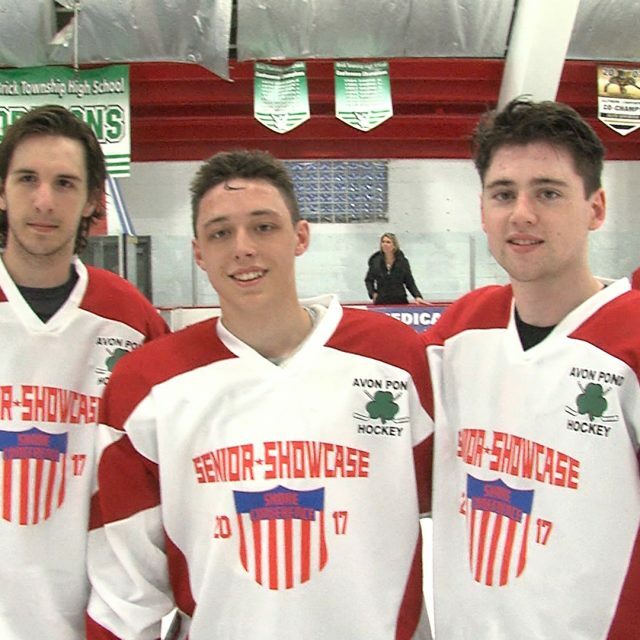 Southern Regional – 5 Central Regional – 1 Matt Flynn scored two 1st period goals leading Southern Regional to a 5-1 win over divisional foe Central Regional on Monday Night in Toms River. 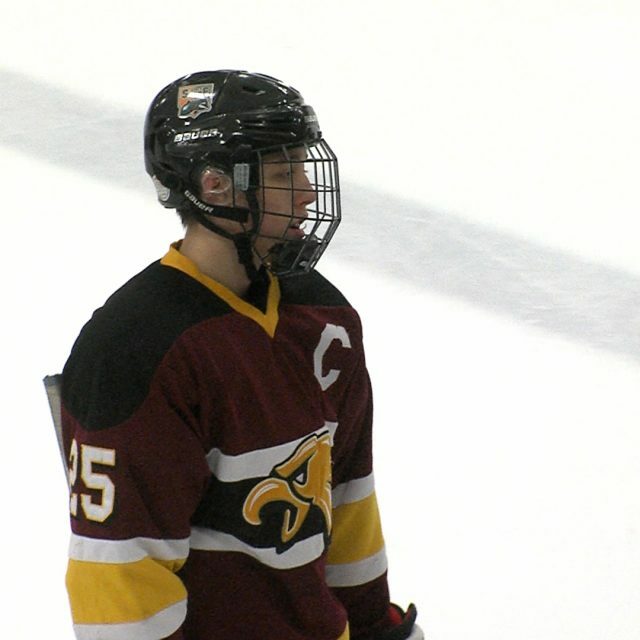 Central’s Thomas Kampf played solidly in goal with 43 saves, but the Southern offensive attack proved to be too much, as the Rams came away with the victory. 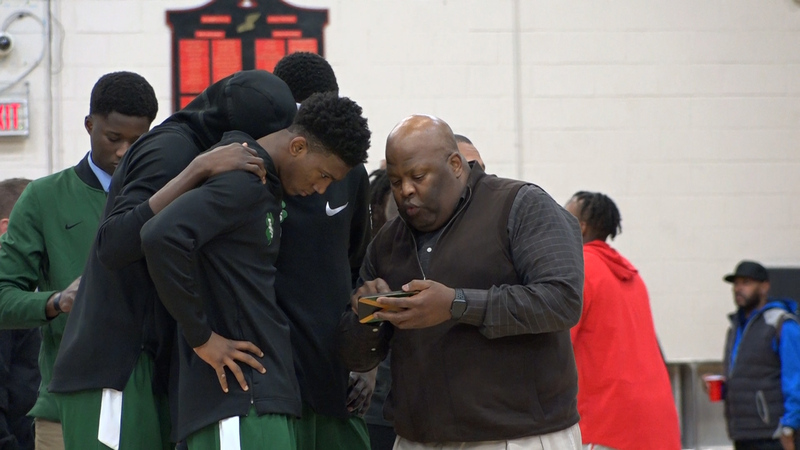 Watch Highlights of Southern vs Central below! Welcome to Jersey Sports Zone! After three years on the Jersey Shore, we’ve expanded our coverage to every part of the Garden State. We are excited to bring you high definition highlights and features of high school sports all year long. 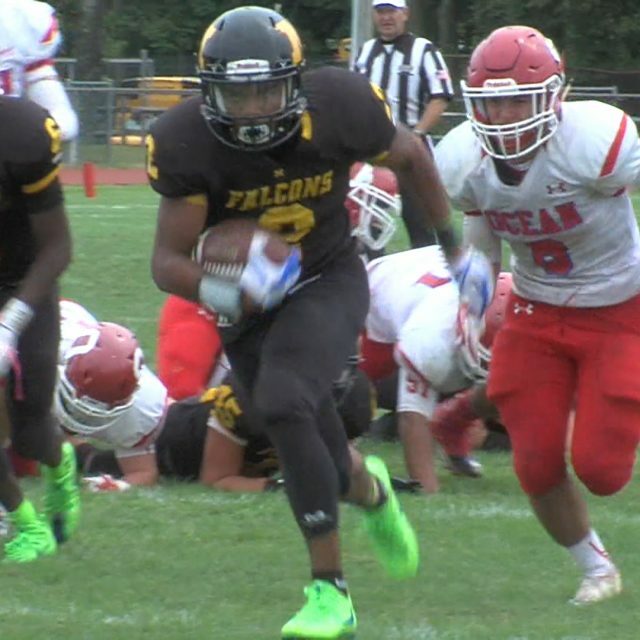 Once again, we have 10 great nominees from the Shore Conference who shined on the Week 8 stage. Cast your vote NOW through Tuesday at 3:00 pm. The winner will get a visit from JSZ and a Game Ball presentation. Thanks to all of our faithful Shore fans for supporting JSZ and to the players for giving us great highlights every single weekend! 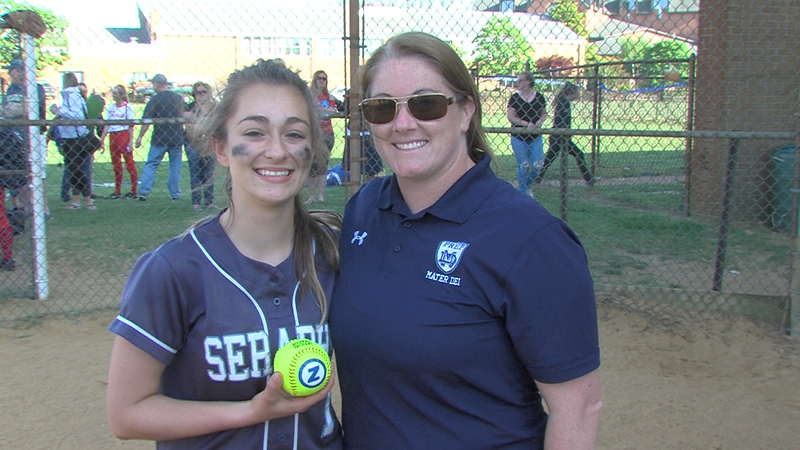 Take Our Poll Last Week’s Monmouth Building Center Game Ball Winner Monmouth Building Center in Shrewsbury has helped us celebrate great athletic performances in the Shore Conference over the past four years. Thanks to the team at Monmouth Building Center for giving us the chance to honor great Shore kids in football, basketball, baseball and softball. Once again, we have 10 great nominees from the Shore Conference who shined on the Week 6 stage. Cast your vote NOW through Tuesday at 3:00 pm. The winner will get a visit from JSZ and a Game Ball presentation. Thanks to all of our faithful Shore fans for supporting JSZ and to the players for giving us great highlights every single weekend! Take Our Poll Last Week’s Monmouth Building Center Game Ball winner – Keansburg QB Danny Vital Monmouth Building Center in Shrewsbury has helped us celebrate great athletic performances in the Shore Conference over the past four years. Thanks to the team at Monmouth Building Center for giving us the chance to honor great Shore kids in football, basketball, baseball and softball. Every Sunday, Jersey Sports Zone will look back on the best plays captured by our cameras. We’ll ask you to vote each week for our JSZ Top Play. The poll is open NOW until Tuesday at 3:00 pm. The winners of each weekly poll will earn an invite to our JSZ Statewide Football Banquet coming up in December. Thanks to all the great athletes for giving us a great batch of Top Plays from Week Zero: Take Our Poll JSZ Game Balls In addition to our Top Play voting, every Sunday we’ll honor the top performers from the week in high school football and nominate them for a JSZ Game Ball. Next week, we’ll have four different Game Ball nominees from different parts of the state. With a limited Week 0 schedule statewide, here are 10 great performances up for our first Game Ball. Take Our Poll Polls will stay open until Tuesday at 3:00 pm. We will stop by a practice and present a JSZ Game Ball to each week’s winner. 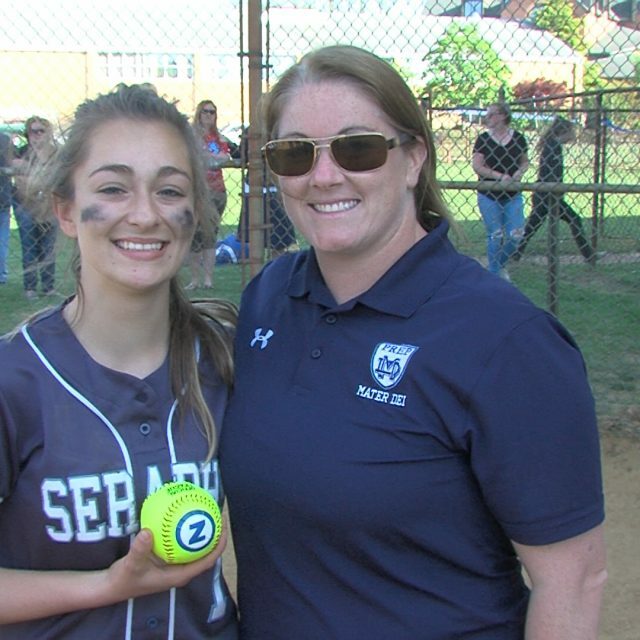 Coaches you can always nominate your players for a Game Ball – just email rich@jerseysportszone.com before Saturday at 11 pm. Sponsor Shout Out Monmouth Building Center has been responsible for honoring athletes in the Shore Conference over the past three years. We’re grateful to have Monmouth Building Center back to support athletes on the Jersey Shore. 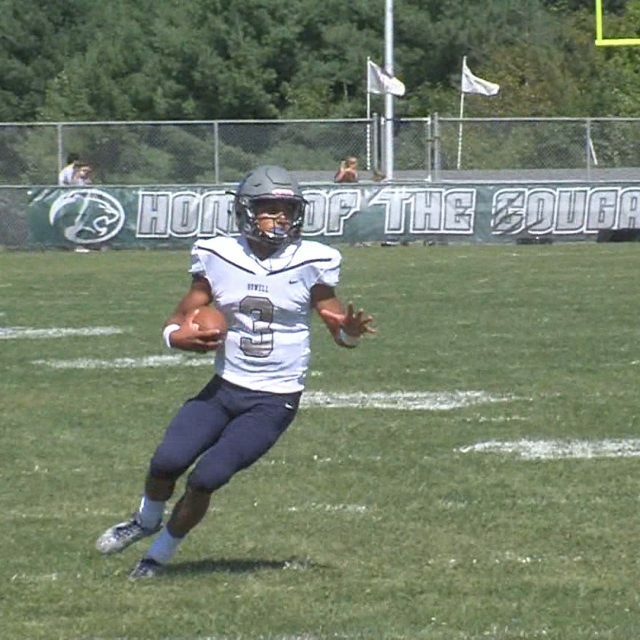 We’ll have our first Monmouth Building Center Game Ball poll up next week Watch JSZ’s Football Highlights Shows! Jersey Sports Zone kicked off its high school football coverage with 18 games on Friday and Saturday. Click below to watch our highlights shows with games that featured big plays, clutch moments and great video. Welcome to Jersey Sports Zone! After three years on the Jersey Shore, we’ve expanded our coverage to every part of the Garden State. We are excited to bring you high definition highlights and features of high school sports all year long. 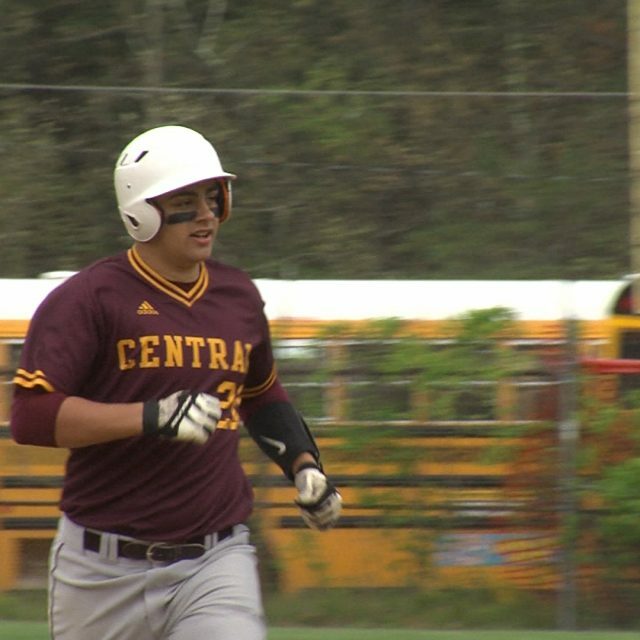 Vance Pelino launched a two run homer and AJ Smith went the distance on a six hitter to pace Central Regional to a 7-2 win over Jackson Memorial in the first round of the Ocean County Tournament. 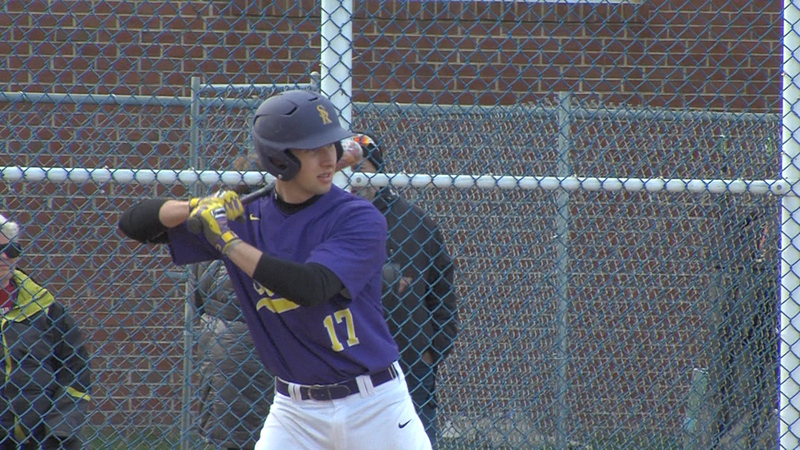 SSZ has all the highlights and post-game reaction in our US Army Baseball Game of the Week Central Regional 7 Jackson Memorial 2 The Golden Eagles scored a pair of runs in the 2nd, 3rd and 4th innings and AJ Smith went the distance on a six-hitter to give Central a spot in the Ocean County Tournament quarterfinals. Vance Pelino blasted a two run homer in the second to get the scoring started. Tyler Aires delivered a two run single in the 3rd and a Mike Bickford sacrifice fly and Tom Ruscitti RBI single made it a 6-0 Central lead. Smith was efficient on the hill especially in the final three innings and threw a complete game on just 86 pitches. Central will face top seed Toms River South in the quarterfinals on Tuesday. 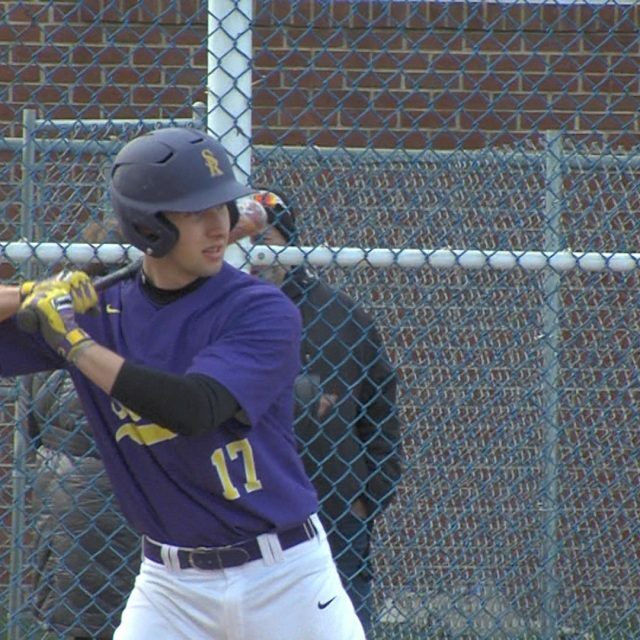 Watch all the highlights from a quality win for Central in our US Army Baseball Game of the Week: US Army Game of the Week Thanks to the US Army, Shore Sports Zone will bring you a Game of the Week in baseball, softball and lacrosse throughout the entire spring. We’ll pick the big games on the schedule and bring you extended highlights and post-game reaction. Thanks to the US Army for supporting our coverage of great Shore Conference sports here on SSZ! 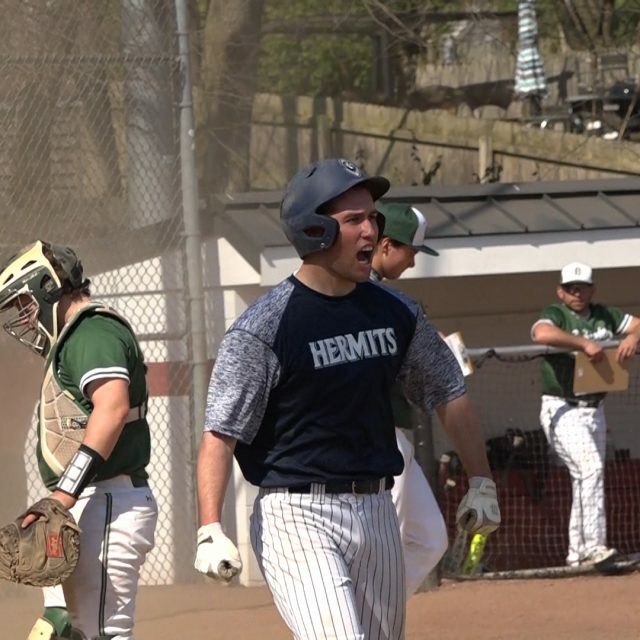 Ocean County Baseball Tournament First Round Scores (1) Toms River South 3 (16) Toms River East 0 – Saturday (4) Toms River North 8 (13) Donovan Catholic 7 – Saturday (9) Central Regional 7 (8) Jackson Memorial 2 (6) Jackson Liberty 7 (11) Point Pleasant Boro 3 (10) Manchester 5 (7) Pinelands 3 (2) Lacey 16 (15) Point Pleasant Beach 6 – 5 innings (12) Barnegat 4 (5) Brick Township 2 (3) Southern Regional 6 (14) Brick Memorial 4 OCT Quarterfinals – Tuesday (9) Central Regional at (1) Toms River South (12) Barnegat at (4) Toms River North (6) Jackson Liberty at (3) Southern Regional (10) Manchester at (2) Lacey Sponsor Shout Out A special thanks to Andy Weinstein and State Farm for sponsoring our Jackson Memorial coverage on Shore Sports Zone. Our sponsored teams get first priority when we choose our shooting schedule every day. Watch SSZ Week Zero Highlights Show! 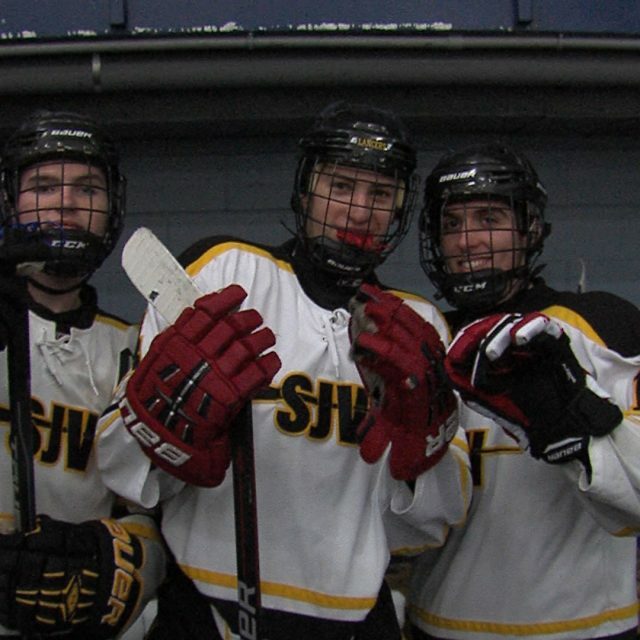 Eight icers vie for SSZ Game Puck – Vote Now! Vote now for Week Ten SSZ Game Balls! Vote Now for Week Nine SSZ Game Balls! 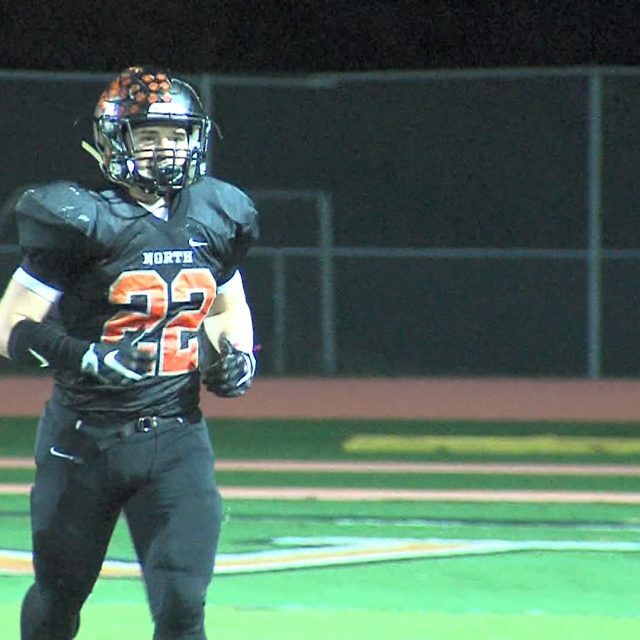 Vote now for Week Eight SSZ Game Balls! 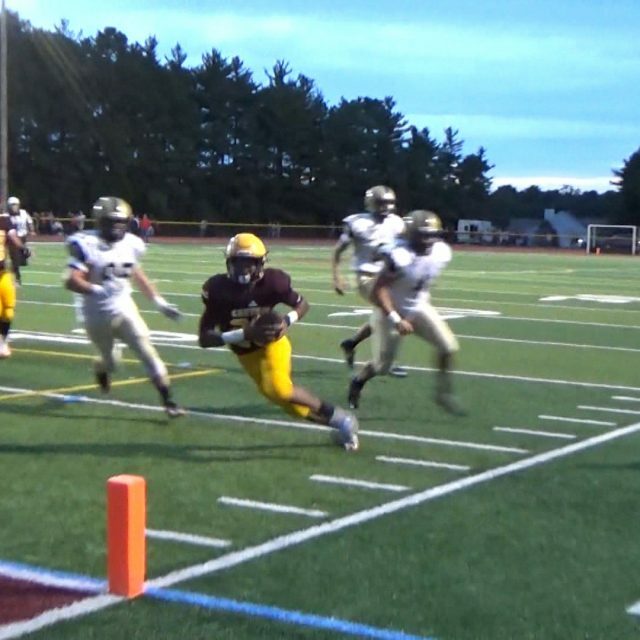 Vote now for Week Five SSZ Game Balls!